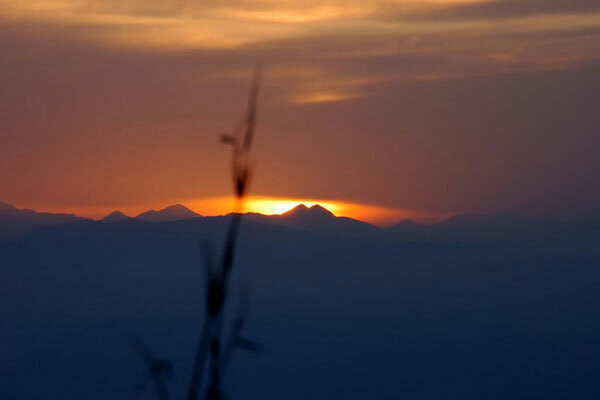 Pick up from hotel at Gangtok at about 10 a.m. & proceed to Lachen (123 Km) at an altitude of 8,600 ft. Enroute visit Tashi Viewpoint, Kabi Lungstok, Naga Waterfalls, the confluence of Lachen chu and Lachung Chu at Chungthang, Arrive Lachen at Late afternoon in the evening & transfer to hotel Night halt, surrounded by fir – clad mountain peaks, overwhelming peace and solitude. Lachen - Thangu - Lachen – Lachung. After breakfast leave for Gurudongmar Lake (17,200ft), Thangu ( 13,000 ft.) and Chopta Valley ( 13,200 ft.). 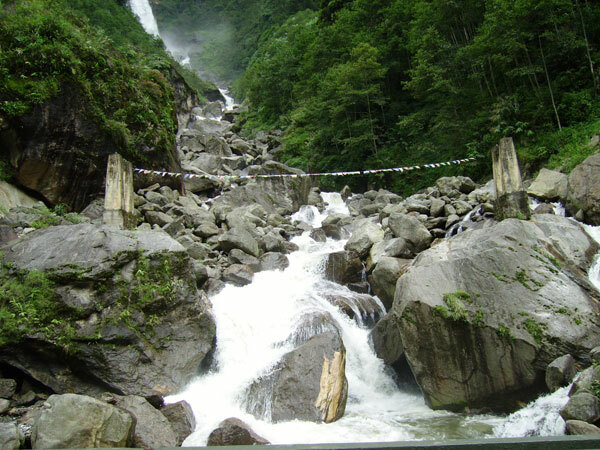 Thangu Valley is a broad valley at the junction of Thangu Chu, Chopta Chu and Lassur Chu. 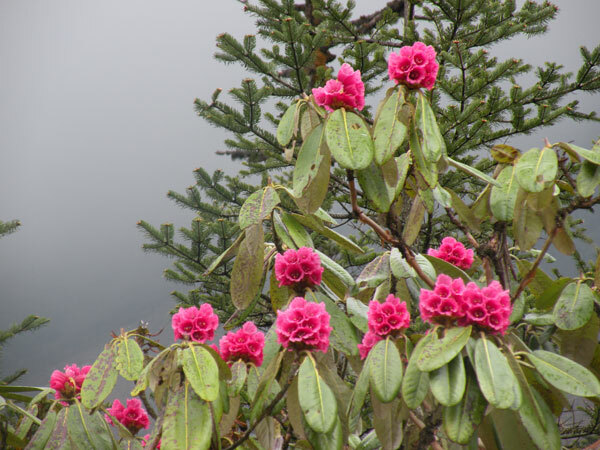 In the spring end to summer months Rhododendrons, Primula and many other Alpine flowers are in full bloom. In the winter months you can play in the snow or even walk over frozen rivers. The unspoilt beauty of the area will take breath away. Come back to Lachen for Lunch. After lunch proceed to Lachung. Enroute see the beautiful Twin Waterfalls and Bhim Nala Waterfalls. Arrive Lachung at Late afternoon in the evening & transfer to hotel. Night stay in Lachung. After breakfast proceed for Yumthang ( 11,800 ft. )Enroute Visit the famous hot spring. 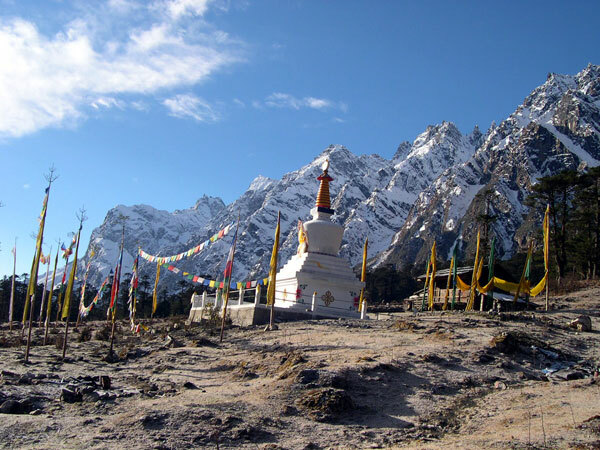 Yumthang is a large valley surrounded by mountains where the tree line ends. In April/ May/ June the valley erupts in a riot of colors as Rhododendrons, Primula and many other Alpine Flowers are in full bloom. 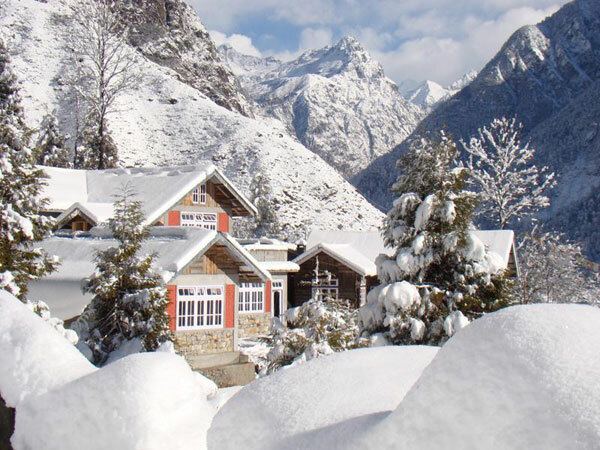 In the winter months, Yumthang is somber with snow all around, and the snow-clad mountains adding to the ethereal beauty. Later come back to hotel have lunch then visit Lachung Monastery, Handicraft and Lachung Village. Night halt at Hotel. After breakfast, leave for Gangtok. Enroute stop between singhik, Mangan and if the weather is clear, get the Khangchendzonga Range. This location offers a majestic view of Mt. Pandim, Mt. Kabru, Mt. Simvo, Mt. Jopuno, Mt. Khangchendzonga and Mt. Siniolchu. After lunch, visit Phodong Monastery. 1. Meet & Greet Upon Arrival At Gangtok. 2. Hotel Accommodation In Twin Sharing Basis. 3. Meal Included At Hotel breakfast lunch & diner. 4. 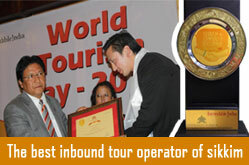 Scheduled Pick Up Transfers From Gangtok North Sikkim Taxi Stand By Chauffeur Driven Charter / Reserve / Exclusive. 5. 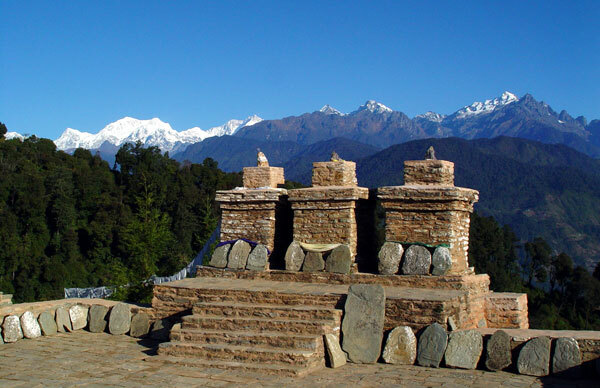 One Half Day Sightseeing Excursions To Yumthang Valley On Contract Basis Using Charter / Reserve / Exclusive. 1. Guest have to report our office executive, a day before the departure time and confirm regarding their visit, as indicated. 2. 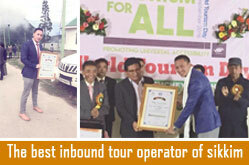 Food will be served on fixed menu basis, for North Sikkim package tour. 3. Full payment has to be made before the COMMENCEMENT OF THE TOUR. No Voucher will be issued without full payment. 4. Children between 4 to 9yrs old will be charged 50% provided if they share the bed with the parents. If they ask any extra bed then we will charge full amount. 5.Same rate will charge if the stay is extended due to natural calamities. They have to board in the same or in different hotel (Subject to availability of room) as per situation. 6. If the clients are stuck in between, from both the side, due to road blockage, they will have to bear the total expenditure from the day to the returning day. 7. Any dispute arises will be resolve under the jurisdiction of North District of Sikkim, Head Quarter Mangan. 8. Galaxy and or their agent shall not be liable or responsible for irregularity, loss, injury, or damage to personal property or otherwise in connection with any accommodation, transportation, trekking machinery or equipment, fire water, civil disturbances, strikes, thefts, or cancellation or changes schedules beyond Galaxy control nor will Galaxy and their associates accept responsible for losses or additional expenses due to delay or changes in plans caused by the aforementioned reasons. 9. In case of non-availability of the desired Hotel, the operator reserved the right to transfer to another hotel of equal standard. However, efforts will be made to keep clients informed of any such changes. 10.Any additional stay in Hotel will be on client’s account. 11.Rates are subject to change without prior notice at time of seasonal review of Tariff. 12.Any arrivals after 18:00 Hrs must be reported in advance. 1. 30 days prior to date of arrival 25% cancellation charges. 2. 21 days prior to date of arrival 50% cancellation charges. 3. 14 days prior to date of arrival 75% cancellation charges. 4. 7 days prior to date of arrival (No Refund). 5. Same rate will charge if the stay is extended due to natural calamities. As per situation. 7. In case, the Tour could not start due to natural calamities, then money will be refunded after deducting the expenditure, which has been made till date. 1. Vehicle will not be at your disposable, it will be available only from point to point (as per the tour itinerary). 2. Beside tour itinerary, extra charges are applicable if you keep vehicle at your disposable. 5. Fare of Luxury Tourist Taxi is different from Normal Tourist Taxi. Confirmation are subject to realization of advance amount (50% of the entire amount) our under mentioned Bank Account, within twenty-four hours from the receipt of the mail. (Please mail us a copy of the deposit slip.) Balance amount you have to pay us before the Check-in Date.